Blog> What is the Si3N4 Ceramic Powder Granulation? Silicon nitride (Si3N4) ceramics have excellent mechanical properties such as high strength, high hardness, good fracture toughness, and unique self-lubricating properties, which have become a research hotspot of high-performance ceramics. Si3N4 ceramic powders are the key raw materials for the preparation of Si3N4 ceramics. The way of granulation of the powders is the key step affecting the properties of the ceramics, which has an important impact on the density and mechanical properties of the final Si3N4 ceramic products. Therefore, it is of great significance for the preparation of high-performance Si3N4 ceramics to study the granulation treatment method of Si3N4 powder and select the best powder treatment scheme according to the actual production situation. In industrial production, the granulation methods of Si3N4 ceramic powders mainly include dry roller granulation, cold isostatic pressing and spray granulation. Compared with other oxide ceramic powders, Si3N4 ceramics are more sensitive to temperature during the sintering process, so it has higher requirements on the size of powder particles and the consistency of surface morphology. Dry roller granulation refers to the dry extrusion process in which the water content less than 10% Si3N4 ceramic powder is compressed into a sheet, and then the block-shaped material is transformed into a granular material in line with the requirements of use through the process of crushing, granulating and screening. 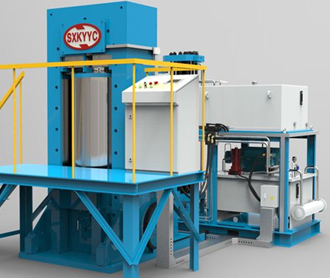 Dry roller granulation mainly relies on external pressure to make the powder through two instead of rotating roller gap compression into a sheet. In the rolling process, the actual density of the material can increase by 1.5-3 times, so as to meet certain strength requirements. The advantages of dry roller granulation technology are high granulation efficiency and low production cost. Compared with spray granulation, dry pressure granulation requires lower binder content. Cold isostatic pressure granulation refers to the granulation process in which the Si3N4 ceramic powder is put into a specific mold and then placed in the cold isostatic pressure equipment to be pressed into a blank through the cold isostatic pressure process and then broken and screened by the crusher. 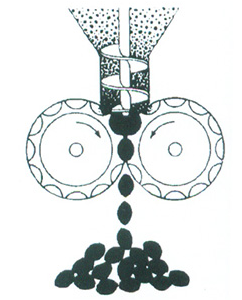 The advantage of cold isostatic pressure granulation is that it takes advantage of the incompressibility of the liquid medium and the uniform transfer of pressure so that the sample can be uniformly pressurized from all directions to ensure the uniform and constant pressure in all directions of the powder. Spray granulation refers to the granulation method in which the mixed slurry is directly sprayed into hot air and rapidly dried to obtain spherical powder particles with regular shapes. Usually, centrifugal or pressure spray granulation equipment is used to mix the Si3N4 slurry and granulate at the same time, so that the Si3N4 powder is evenly distributed. Thus, the sphericity of Si3N4 particles and the fluidity of the powder were improved, and the particle size distribution of the powder was improved. The spherical Si3N4 powders with high uniformity and consistency were prepared by optimizing spray granulation process parameters. The factors such as temperature, pressure, feeding speed, mixing time and the type of binder have an important influence on the size and dispersion of Si3N4 powder after granulation. The advantages of spray granulation process are that it can avoid the agglomeration and sedimentation separation of components in the slurry, maintain the original uniformity of slurry and obtain uniform particle size distribution and good fluidity. Spray granulation technology can realize continuous automatic production, improve production efficiency and reduce dust pollution. The application of spray granulation technology can improve the density and uniformity of the blank, as well as the sintering performance of the blank. Spray granulation technology has been widely used in chemical industry, metallurgy, ceramics, cement, food, medicine, and other industrial fields. In addition, the choice of binder is also an important factor in the spray granulation process. At present, the commonly used adhesives for spray granulation include phenolic resin and polyvinyl alcohol. Ethylene glycol is easily soluble in ethanol and can be fully mixed by the rolling ball mill. After treatment, the powder particles are uniform, with good sphericity and high sintering activity. It can be seen from the technology of Si3N4 ceramic powder granulation that the powder post-treatment engineering is a system engineering which includes many units of multi-discipline and multi-category. As a new industry, powder granulation is attracting more and more attention. With the rapid development of technology and granulation equipment, powder granulation has been widely used. Cathie Montanez is the Project Scientist in Stanford Advanced Materials (SAM). She once served as a research professor at university's school of materials science and engineering, and now is responsible for the performance testing and technical guidance of SAM's products such as refractory metals, ceramics, laboratory crucibles, and grinding bars, and so on. Previous: What Are the Types of Heat-conducting Filler and Their Applications?